Large demesne with important collection of trees, lake, walks, formal garden. It is possible to do a whistle stop tour of the world in this fascinating demesne surrounding majestic Birr Castle and embraced by the River Camcor. You can globe trot in minutes from Pakistan to New Zealand, and from Mexico to a glade that looks like the Yunnan region of China. In fact it is part of the Yunnan for all of the trees and shrubs are the realisation of a plant hunter’s dream brought back from an expedition in ’93 by Brendan, Lord Rosse and propagated at Birr. The 78 species, including birch, juniper, acers and cotoneasters, together with other recent introductions from around the world, are part of an exciting tradition of plant exploration at Birr . 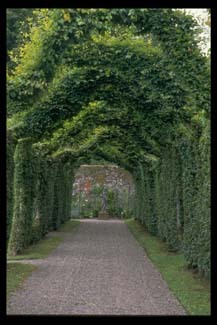 There are many extraordinary things waiting to be discovered in the 130 acre grounds: the tallest box hedge in the world ( due a vertigo defying shave), the Birr Zebra (a beech tree with amazing striped leaves), otters, nesting corncrakes, a hidden gravity driven water fountain amid a fernery, or an elephant foot tree. On the far side of the lake, children can try to catch a glimpse of Sweeney, who lurks in the kind of native wild wood that existed in Ireland a millennium ago. Nearby huge a Magnolia kobusso covered with white bracts they look like clouds come to earth. 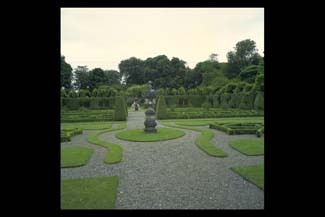 Within the landscaped park are the fruits of three generations of distinguished gardeners spanning a century. 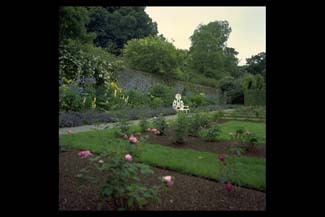 The 5th Earl of Rosse made the terraces and began the formal gardens, the 6th Earl became a botanist, subscribing to and organising plant expeditions especially to China resulting in an important collection of trees and shrubs - you can follow the excellent Red Tree Trail around 50 Trees of Distinction. 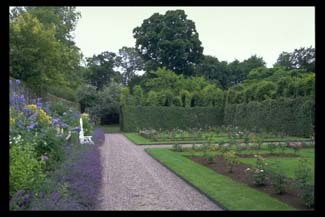 Together with his wife Anne (daughter of Leonard Messel, the owner of Nyman’s Garden), Michael Rosse enhanced the gardens - Anne designed the Baroque Garden with a pleached hornbeam cloister, box parterres and delphinium border where the famous Paeonia ‘Anne Rosse’ tree peony grows, its golden petals streaked with crimson.. The castle was remodelled in the 19th century but parts of it date back to 1620 when the lands were acquired by Sir Laurence Parsons - and his descendants still live there. Tradition is important in this family - specimens are still being propagated from seed brought back from the wild, and the gardens play their part as a field station for the Royal Botanic Gardens Edinburgh, in a propagations programme. 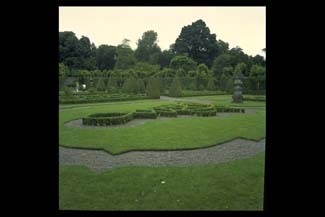 The Baroque Garden and the terraces were restored recently, helped by funding from Great Gardens of Ireland Restoration Programme, and a new fountain was designed by the present Earl in the form of a Celtic Cross. A magnificent new treehouse set amongst a giant redwood and a chestnut tree, a huge bouncing pillow and a sandpit has made the castle a fun family destination now too. Entrance in Rosse Row in centre of Birr.